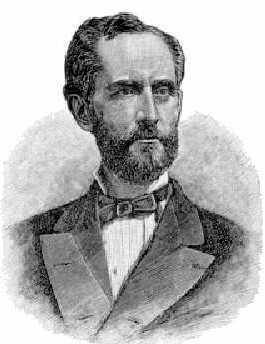 Manning Ferguson Force was born in Washington, D.C. in 1824, the son of Peter Force, the city’s mayor. He attended Harvard, graduating from the school of law in 1849. The following year, Force moved to Cincinnati, Ohio and began his law practice. In 1861, Force joined the Union forces as major of the 20th Ohio Volunteer Infantry, serving in the western theater as part of General James B. McPherson’s 17th Corps. Colonel Force's 20th Ohio bore the brunt of the Battle of Raymond. Osborn Oldroyd related the number of casualties from the 20th Ohio to his commander: "I took the roll-book from the pocket of our dead sergeant, and found that while we had gone in with thirty-two men, we came out with but sixteen - one-half of the brave little band, but a few hours before so full of hope and patriotism, either killed or wounded. Nearly all the survivors could show bullet marks in clothing or flesh, but no man left the field on account of wounds. When I told Colonel Force of our loss, I saw tears course down his cheeks, and so intent were his thoughts upon his fallen men that he failed to note the bursting of a shell above him, scattering the powder over his person, as he sat at the foot of a tree." Following the Siege of Vicksburg, Force marched on to Georgia where he fought in the Atlanta Campaign. He was severely wounded in the face during the Battle of Atlanta and was disfigured for life. For his valor during the Atlanta campaign, Force was promoted to major general of volunteers in March of 1865. In 1892, he was awarded the Union Medal of Honor. The citation read, "Charged upon the enemy's works, and after their capture defended his position against assaults of the enemy until he was severely wounded." The thirty-seven-year-old lawyer began the conflict as a lieutenant colonel and ended as a brevetted Major General. Sgt. Osborn Oldroyd noted his leadership when he wrote in his diary: "As Colonel Force called us to 'Attention' this morning one of the boys remarked, 'I love that man more than ever.' Yes, we have good reason to be proud of our Colonel, for upon all occasions we are treated by him as volunteers enlisted in war form pure love of country…." In his memoirs printed after the war, Force stated: "When lying there (in the trenches outside Vicksburg) it sometimes occurred to me, what a transformation it was for these men, full of individuality and self-reliance, accustomed always to act upon their own will, to so completely subordinate their wills to the wills of other men...Their practical sense had told them an army differs from a mob only in discipline, and discipline was necessary for self-preservation." After the war, he returned to Cincinnati, Ohio, where he became a Supreme Court Judge. He also authored several law books and became a prominent writer as well as a lecturer. Manning Force is buried in Spring Grove Cemetery, Cincinnati, Ohio.